Not so long ago, having a website was an afterthought for most businesses. Often it meant just having an informational page with a few images and some contact information. When you talked about website design, you meant finding a programmer who knew HTML. Today’s consumers are expecting a lot more from a website, so you need a design that can meet their needs. At Emphasize Design we can help you give your customers what they want with the best strategies to keep satisfied. Great website design means putting customers first. Your top priority should always be about creating the best possible user experience. Your potential customers are using the web to thoroughly research products before they decide what and where to buy. When they come to your site, your design should make it easy to find what they want before they decide to go someplace else. Creating an efficient web design for your Calgary business is not as easy as it might appear. It requires testing and consultation with your employees, sales team and customers. Your design team should provide all involved an opportunity to offer feedback and share their opinions. That data can then be used to improve the site to help give customers what they want. As impressive as websites can be, there’s little worse than going to a site and overwhelmed by buttons, menus, and options. Bad design is in your face. Good design stays out of your way. A great website seems simple but offers everything your customers need. Website design in Calgary: How do you give your customers what they want? 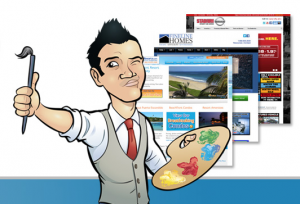 Done right, your website can be the perfect online salesperson who knows where to find everything and how get there. Make it work right with today’s gadgets. Your site needs to be easily read and operated from a variety of tools. Responsiveness is at the centre of What’s New For 2014. A single video can take the place of pages of text. Inspire conversation with social media. Discover more Essential Elements For An Inbound Marketing Site in our resource centre. What a Difference a Blog Makes! The best website design in Calgary means finding ways to stand out above the rest. Attracting quality visitors with a great design is just the beginning. Once you’ve converted visitors into customers, you need ways to keep them coming back. You’ve heard it before: on the web, content is king. A blog can help you earn the trust of your customer, but that takes time and effort. If blogging doesn’t seem like it could be of use to you, or if you’re wondering “How Does Blogging Help My Business?”, visit our resource centre for more. A blog can help you define your company’s philosophy and communicate your mission to your customers, but it also allows you to regularly provide your site with new content. It lets you keep your site current and gives people a reason to return for more. Companies that blog bring in far more business than those who don’t. Even if you are already blogging, you might not be getting the most out of it unless you are doing it often enough or doing it in a way that maximizes SEO. Finding the time and talent to blog effectively presents a challenge, but can you afford to go without one? Good website design in Calgary is not a simple matter of hiring someone who knows computer code. Your site needs to help your customers find what they want quickly and easily, so they keep coming back for more. The team at Emphasize Design will put all the pieces together and put your site to work for your business.